Voted first-place vendor at the Farmer’s Market in Clermont, Florida, recently, Allison Fogarty, 28, has been cooking up a storm for some pretty cute customers on a regular basis as the owner of DOGGY Delights By Allison. “Rachael said, ‘Hey Allison, would you like to cook with me on my show sometime?’ So, I will be going to New York to see her. Getting to know her was the best thing. She knows I shop at BJ’s, so she sent me a $500 gift card in the mail! She’s a big dog lover! 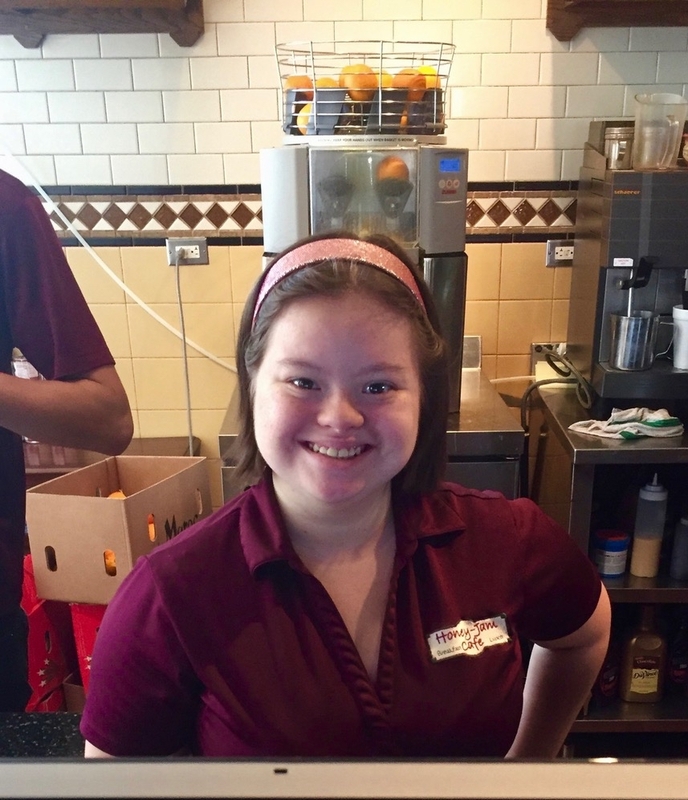 Here’s the rest of Sam’s interview with Allison, who moved from Chicago (where she was very involved with the UPS for DownS organization) to Florida in 2017, and soon started her own business through the Down Syndrome Association of Central Florida’s very first Entrepreneur Academy. “When we lived in Illinois, we did our first business called Lunch Break. It was for the teachers where my mom used to teach. We made and delivered about 30 lunches a week at her school—we did that job for 2 or 3 years, and then after that we moved here because we wanted to see my brother, Laura, and the kids. We started babysitting them every day—Monday, Tuesday, Wednesday, Thursday, and Fridays. “DoggyDelights by Allison was my mom’s idea. We saw a lot of dogs in our neighborhood, passing by our lanai, and that gave her the idea. So we looked up all the recipes on her lap top, printed them, and tried them out. Then I’d say, ‘Hey mom let’s do this instead of that.’ So we started changing the recipes. Now we make flavors like chicken and rice, peanut butter, pumpkin, and sweet potato treats. We use no salt and no sugar, so they are very healthy and good for dogs. People can order online—or we can deliver to their house—and we go to a farmer’s market on Sunday mornings. “Actually making the batter for the treats is my favorite part. My least favorite part is to put the batter in the silicone trays. I made 5 batches of sweet potato, and four batches of chicken and rice, and 6 batches of pumpkin treats today. Allison’s mom, Pat, says their neighbors with dogs have really encouraged Allison. One neighbor took her to the rescue shelter to test out all the treats on the dogs there. The same neighbor also comes to the market every other week with dogs that need to be adopted. “And I always say, ‘I wish I could keep you,’” says Allison, who would like a dog. “I felt the magic in me, and it helped me sing,” says Nick Pesce, 21, who worked diligently to land his dream role as Bert in the UPS for Downs/EDGE of Orion production of Mary Poppins, Jr. last week. Not only did he practice on his own, (“Every day with a singing machine and my Bluetooth in my room.”) as well as with his family, he also had the help of someone special. An inclusion student through high school, Nick’s middle school choir teacher, Kelly Harper, volunteered once a week all summer to help him prepare for his audition. “Ms. Harper is always so fun and nice. She is a great choir teacher! We have so much fun and are silly together,” he says. What did he learn in this year’s role? “I learned to tap dance, and to work with others on a script. . . . To work really hard for what you really want. . . .and . . . Anything can happen if you let it,” he says with a smile. What were some of your best and worst memories from high school? “I was the sophomore prince for homecoming, but my favorite thing was playing in the marching band with my drum line friends. I miss those friends so much. They left to go to college.” Nick says his worst memory was a cooking class with a teacher who just didn’t get what inclusion is all about. He wound up dropping the class. Little Something Extra Bakery in Oak Lawn, Illinois, comes by its name honestly. Maria and Bill Veal say their son Billy’s extra chromosomes inspired not only the name, but the bakery itself, which employs Billy and three other people who are differently abled, including Billy’s best friend, Angel. With art on the walls created by students at Oak Lawn Community High School reminding guests that happiness begins wherever you happen to be, the bakery has given Billy the opportunity to take on more responsibilities, and to try his hand at different tasks—including everything from preparing dough and greeting customers to bussing tables and mopping and sweeping. Now in the transition program, Billy also works at both DoubleTree and at Taylor Candies. He says he enjoys “working with friends” at the DoubleTree, where he folds towels and does the laundry. "We make the difference," says Sam Anderson of people with Down syndrome. Watch the trailer for Sarah Taschetta's documentary, told entirely from Sam's perspective, and stay tuned for the soon-to-be-released final film! SUBSCRIBE today to receive email notifications each time we post a new interview! Following is the rest of Sam’s interview with Michelle, who is also currently taking a culinary arts class at a local community college to learn the kitchen skills she’ll need to be independent. What’s the best question a student has asked? “Many students ask me what it’s like to have Down syndrome. I tell them that my life is great, and that I don’t know what life would be like if I didn’t have Down syndrome. What’s the accomplishment of which you are most proud? 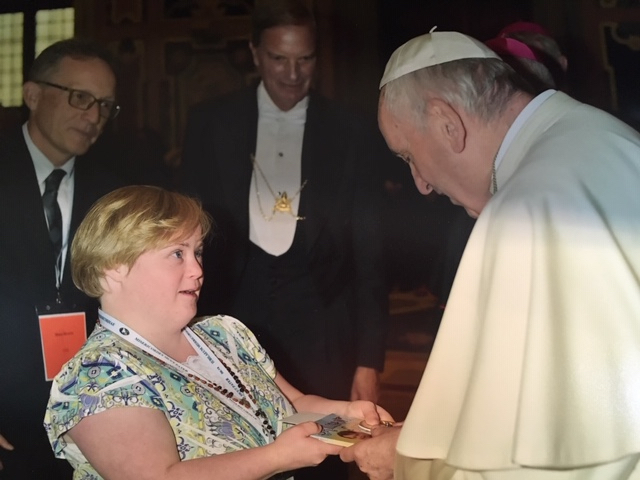 “I am proud that I have been able to advocate for myself at schools, and in my community to help myself and people with Down syndrome and other disabilities. Sign up with your email address to receive each new interview. We respect your privacy. This list will not be shared or used for marketing purposes. The road less traveled. It’s a road Amanda Ewald, 19, has traveled her whole life—to find inclusion opportunities. She became the first young woman with Down syndrome to attend Buffalo Grove High School, and to participate on the women’s swim, badminton, and bowling teams there. “I hope to be a ‘Super Senior’ there next year,” she says. She and her family believe it will be best for her to stay in an inclusive setting and to continue making academic progress, so we wish them well as they head into their IEP! 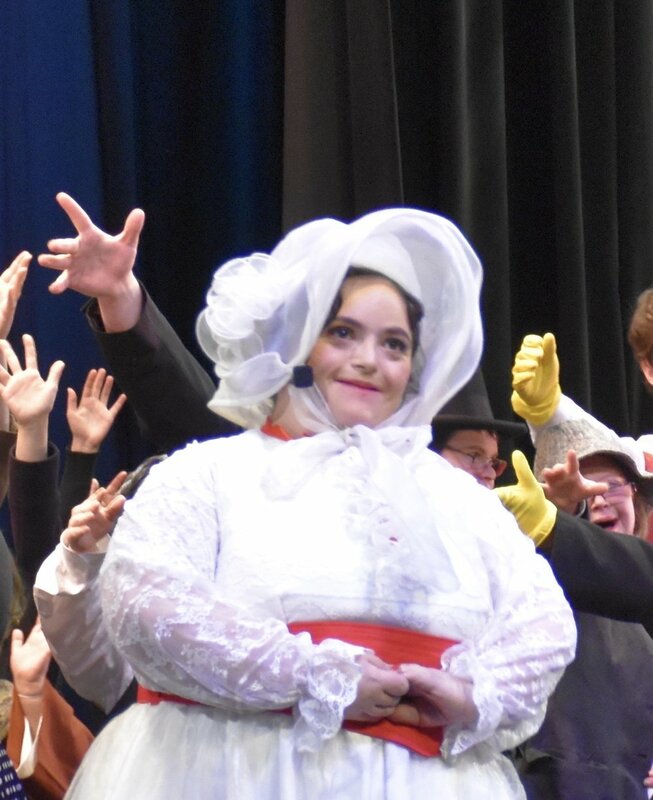 Read the rest of Sam’s interview with Amanda below, including her tips for fellow actors with lots of lines to memorize (She recently starred as Dorothy in the UPS4DownS production of the “The Wizard of Oz”). Social Studies is Hiba Qureshi’s favorite class at Lincoln Junior High in Naperville, where she’s a fully included seventh grader. What does she like best? “Doing my homework,” she says, adding that she’s also especially enjoyed learning more about India, home to her maternal grandparents. What does she love most about India? “The dances,” says this young lady who loves joining in on the traditional dances at family weddings. After a three-year struggle with school administrators in Glendale Heights, Hiba’s parents moved to Naperville so she could be included in the regular classroom. These days, some of Hiba’s dreams are big: “to go to college,” and “to be a doctor.” And some are simple: “I want a dog,” she says.